Looking for the Ultimate Blues Clues Pictures, Posters, Clip Art, etc? Great!!! 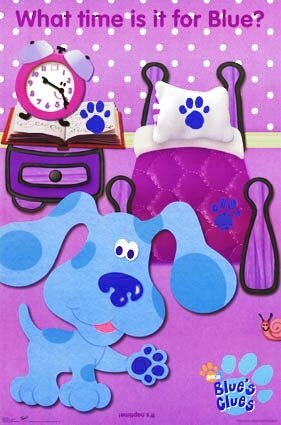 I have compiled a large selection of Blues Clues Posters and Pictures for you to use in decorations, invitations, thanks you notes or whatever else you want! So sit back and enjoy the images below, I know youll find what youre looking for. Here is a great selection of posters to either hang around the party area or give as a present. The clipart below can be edited by using a simple photo editor. Then simply cut and paste to fit your decorations or invitations. To save the file to your desktop, right click on the image and click "Save File As". These coloring pages make a great ice breaker activity or a project to break up the party. You can also have your children color them before the party and hang them around the house as decorations. To print the picture, Right-click and select "Print Picture". Do you know if your birthday falls on the same day as a famous person? Make your child's birthday fun and make them a delicious famous recipe! Maybe you can even hire them an entertainer! Starting in December, I will be applying this new theme to all pages throughout the site. Please be patient, it will be worth the wait. UKBP is planning another great party contest for December. Check back as new info will be posted under this column. As new themes are posted by either UKBP or viewers like you, we will post them in this new column. Argentina - Dance the waltz at 15. When girls turn 15 they have a huge party and dance the waltz with their father and other boys.